Leading figures in the campaign for Britain to leave the European Union say they want to be able to scrap VAT on fuel to help the poorest households. Tories Michael Gove and Boris Johnson and Labour's Gisela Stuart wrote in the Sun that the tax on energy bills cannot be scrapped because of EU rules. But Chancellor George Osborne accused them of "fantasy land" economics. Remain campaigners said Vote Leave were promising a "make-believe land of milk and honey" if the UK left the EU. There is one week left to register to vote in the EU referendum on 23 June. In their article, the Vote Leave politicians said they would seek to spend some of the cash saved by quitting the EU on cutting VAT from household gas and electricity bills, a tax imposed by the then Conservative government in 1993. "The least wealthy are hit particularly hard," they wrote. "The poorest households spend three times more of their income on household energy bills than the richest households spend. As long as we are in the EU, we are not allowed to cut this tax. "When we Vote Leave, we will be able to scrap this unfair and damaging tax. "It isn't right that unelected bureaucrats in Brussels impose taxes on the poorest and elected British politicians can do nothing." 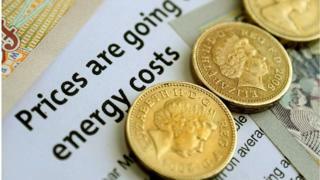 VAT on domestic fuel bills was cut to 5% under the Labour government - the lowest rate allowed under EU rules. In 2014, the average bill for a customer of a big six energy firm was £1,190. Mr Gove told the BBC it had been a "mistake" of the previous Major government to introduce the tax, adding: "The Conservative government at the time did so because of the economic damage that the exchange rate mechanism of the European Union had caused. "I think it is now time to acknowledge that that was an error." The justice secretary said it would be up to the prime minister and the chancellor to axe VAT, but said he backed such a move because it was "an unfair tax that hits the poorest people hardest". Mr Osborne tweeted his attack on Vote Leave's claim, saying leaving the EU would lead to a smaller economy, "a hole in public finances" and higher taxes including VAT. Energy Secretary Amber Rudd said it was "unequivocally" not the case that bills would fall if the UK left the EU, and that membership actually helped keep household costs down. Remain campaigners said Leave-backing Conservatives Liam Fox, John Whittingdale and Iain Duncan Smith had previously voted against moves to reduce VAT on domestic fuel. Britain Stronger in Europe also released a report which they said detailed Leave's "unaffordable" spending commitments. They said more than 20 commitments, totalling £110bn, had been made - eclipsing the potential saving from leaving the EU. Vote Leave's Chris Grayling dismissed the figures as "a complete fallacy" and "absurd mathematics", saying his side had been merely illustrating what could be done if the UK's contributions to Brussels were clawed back. With just over three weeks to go before polling day, two opinion polls for The Guardian gave the Leave side a narrow lead. Meanwhile, Business Secretary Sajid Javid warned of the impact of leaving the EU on small and medium-sized enterprises. He cited Department for Business, Innovation and Skills analysis, estimating that 8% export to the EU and a further 15% are in the supply chains of other businesses that export to the EU. But Vote Leave's John Longworth said the government's figures were "extremely questionable", that businesses were held back by EU "red tape" and that Mr Javid had "changed his mind" over the EU.